The Panama Canal, or "Big Ditch," as it has often been called, was constructed with a blend of sheer ingenuity and painstaking attention to detail. It took ten years and many millions of dollars to construct the giant locks through Panama's deadly jungles, but completion of the monumental project assured America's stature as a world power. Although some take this marvel for granted today, Congress felt the canal was of such importance that in 1915 it appropriated 50 million dollars for an exposition celebrating its completion. San Francisco was selected as the site of the festivities, giving that city an opportunity to showcase the rebuilding undertaken since the devastating earthquake of 1906. Congress also authorized a series of commemorative coins to mark the occasion: a silver half dollar, a gold dollar and quarter eagle, and an extraordinarily impressive pair of $50 gold pieces. America was not the first country to envision a canal across the slender Panamanian isthmus, which at its narrowest point it is only about 50 miles across, making it the logical location for such a waterway. The Spanish conquistadors conceived it as a shortcut to the Pacific coast of the Americas. In 1880, the French actually began construction, but unfortunately, the consortium which undertook the project, the French Panama Canal Company, underestimated the scope of the task. After ten years and $287 million dollars, they were forced to abandon the effort. The United States also saw the benefits it might reap from a Panama Canal - particularly after the mid-19th century, when the California Gold Rush opened America's West to ever more intensive development and greatly expanded shipping between U.S. ports on the East and West coasts. With the Spanish-American War of 1898 came the realization that floating a two-ocean navy was logistically overwhelming, and the need for a canal became even more apparent. In 1902, Congress passed the Spooner Act, authorizing President Theodore Roosevelt to acquire the rights to build a canal and then to proceed with its construction. Roosevelt, with his usual determination, orchestrated the independence of Panama from Colombia and a treaty with the Panamanians for the canal. The canal was completed at almost the same time as the outbreak of World War I in Europe. The war began officially on July 28, and the new canal opened to traffic just 18 days later, on August 15. Americans, however, were still three years away from direct involvement in the conflict, and the Panama Canal was not only closer to home but also a source of more immediate interest to many in this still rather insular country. The exposition held in San Francisco reflected the nation's exuberance over its remarkable accomplishment. It featured exhibits by 36 foreign countries, 44 states of the Union and several U.S. territories, as well as such attractions as a racetrack, a livestock building and an amusement midway. The fair drew an estimated 19 million visitors during its more than nine-month run, which lasted from February 20 to December 4, 1915. 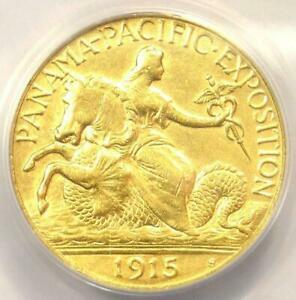 Congress didn't get around to authorizing the coins commemorating the occasion until January 16, 1915, the very eve of the fair. The enabling legislation called for a silver half dollar plus gold coins in three denominations: $1, $2.50 and $50. The quarter eagle (or $2.50 gold piece) and the $50 gold piece were the first U.S. commemoratives issued in those denominations. Mintage limits were set at 200,000 for the half dollar, 25,000 for the gold dollar, 10,000 for the quarter eagle and 3,000 for the $50 piece, with these 3,000 subsequently being divided equally between round and octagonal versions. Upon the recommendation of the federal Commission of Fine Arts, the Treasury Department turned to outside artists for help in designing the coins. It commissioned sculptress Beatrice Longman of New York to design the quarter eagle. Illness forced Longman to withdraw after she had done just preliminary sketches - and the quarter eagle's design then fell to Charles E. Barber, the Mint's chief sculptor-engraver, and his longtime assistant, George T. Morgan. Barber was undoubtedly happy with this arrangement, as he consistently opposed any coinage designs fashioned by artists from outside the Mint. Extremely territorial, Barber was also exquisitely sensitive to criticism of his own mediocre creations, particularly since the lukewarm reception afforded his series of regular issue silver coins that debuted in 1892. Barber's design for the quarter eagle's obverse shows an allegorical figure - the goddess Columbia - astride a hippocampus, a Greek mythological sea horse with the head and forequarters of a horse and the tail of a fish. In her hand is a caduceus, the symbol of the medical profession, signifying the strides against yellow fever that had helped make the canal's construction possible. The date is below this portrait; above it, along the rim, is the inscription PANAMA-PACIFIC EXPOSITION. Morgan designed the reverse, which depicts a left-facing American eagle perched atop a plaque on which is inscribed the motto E PLURIBUS UNUM. Below this is the statement of value - 2 ½ DOL. - and above it, along the rim, is UNITED STATES OF AMERICA. The quarter eagles were struck (as were all the Pan-Pac coins) at the San Francisco Mint. The S mintmark appears to the right of the date. Although the maximum authorized mintage of 10,000 coins was produced, due to weak sales, 3,251 pieces (along with 17 pieces made for assay) were melted in the fall of 1916, leaving a net mintage of only 6,749 coins. Intimately associated with the promotion and distribution of the Pan-Pac coins, as well as several other commemorative issues from the early 20th century, was Farran Zerbe. Zerbe's numismatic reputation and political clout was such that he was placed in charge of the Exposition's Coin and Medal Department, which he incorporated into his own traveling exhibit called "Money of the World." As an energetic promoter of numismatics for several decades, Zerbe did more to popularize coin collecting in this country than any other individual, with the possible exception of B. Max Mehl. Zerbe marketed the five Pan-Pac commemorative issues in various combinations: single coins, short sets of three, full sets of five and double sets of ten coins that showed both sides of each coin. He offered the coins to collectors through the mail, to the general public at the fair, and, in special mailings, to bankers. Individual quarter eagles were offered at $4.00 each and delivered in envelopes imprinted with the coins description, designer's name and price. Although Zerbe's marketing methods were laudable, finding buyers at $4.00 for a $2.50 gold coin when wages were low, interest in numismatics was insignificant, and political and economic uncertainty high, was a difficult task at best. Many of these quarter eagles were mishandled by the public, and relatively few survive in the higher mint-state grades, particularly above MS-64. At least one brilliant proof, without the S mintmark, is reported to exist, but this is unconfirmed by Mint records. Counterfeits are known: these are weakly struck and will show depressions and tooling marks. Points to check for wear include Columbia's head, breast and knee, the head and shoulder of the hippocampus, the eagle's neck and legs, and the torch band on the column supporting the plaque.